I must admit I’ve taken my time embracing the idea of living minimalist. At my own pace I’ve gotten rid of the clutter and even getting my wife onto the bandwagon. It’s been an interesting and revealing experience so far as I’ve mentioned here a few times. Living (or trying to) minimalist has taught me a few things about my life, about what’s important and how to enjoy life more. I move all completed/read emails out of my inbox to other folders that fits the description. ie. “done” or “read”. Any mails remaining in my inbox are mails that still require work or attention. The goal is to by the end of the day have nothing remaining. 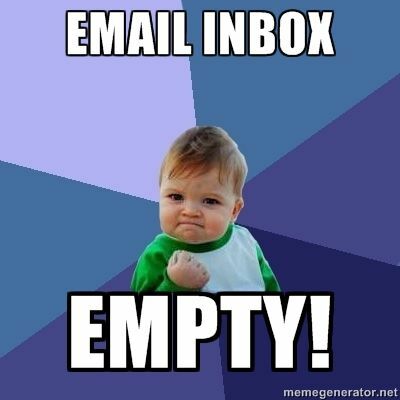 Leaving the office with a clear inbox is a great feeling. Granted this does not always happen, and we regularly continue work on an email the next day, but even dealing with a few emails, 2 or 3 is better at constantly looking at a 1000 email filled inbox with unread / to do email scattered across in there everywhere. The more decisions we make, the less likely we are to make good decisions or get frustrated by the amount of decisions we have to make every day. So minimize your options and make decisions easier. Create a weekly meal plan to lighten your load of daily decisions. With less “stuff” in your house you have less things to maintain which means your mind is occupied with less thoughts of clean this, re-organize that and fixing things standing around in the house. I try and buy food for the week in advance and plan my lunches. This removes the time wasted on deciding what to eat for lunch. Plan your wardrobe for the entire week, or even better dress the same every day. See “why successful people dress the same every day“. One of the best things I did was learn to say no. If we are not careful our entire week can get booked full very quickly. Especially if you have a big circle of friends. When it comes to social arrangements for only myself, and not my wife I did the same things I do here at work: I book out my calendar for certain times of the day to prevent others from taking this time from me. Typically this would be 6:00AM to 8:30AM, and 15:00PM to 18:00PM. These time slots are mine to do with as I please. If I want to go to the gym I can, if I want to arrange coffee with a friend after work I can. If someone asks me to for a social meeting at 16:00 it has become very easy for me to say “sorry I can only meet you at 18:00” or decide for myself if I want to use MY time to meet with this friend. It was also very interesting to note that once we withdraw from all the hundreds of social gatherings and learn to say no it is only a matter of time before we start arranging the same social events but out of our own will. Because we want to and this time from a mindset of clarity, peace and balance. From the above 3 points it is obvious to me that a clear, open, at-peace mind is the most important thing in minimalism. For me minimalism is everything we do to clear our minds so we can focus on what is important. It’s the things we do to get rid of the noise. What is your main sources of noise?